Here you will find origami class info, product reviews, photos and other paper fun. Thanks for visiting! 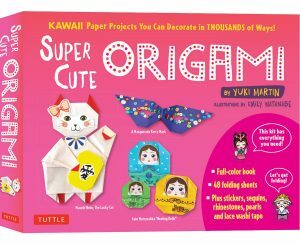 I am excited to share the news of my first publication, Super Cute Origami Kit, available now! Please see my NEW page for the details! I am very passionate about how a mere piece of paper can be folded into infinite possibilities. Welcome to my website full of origami wonders. Happy Folding! Interested in requesting a class, special project, or leaving a comment? Please contact me from the form below, and I will do my best to respond promptly. Thanks!